The new version of Bullet Physics is available. Bullet Physics is a professional open source (C++) collision detection, rigid body and soft body dynamics library. The library is free for commercial use under the ZLib license. Bullet is available for all major platforms including PS3, XBox 360, Wii, PC, Linux, Mac OSX and iPhone. 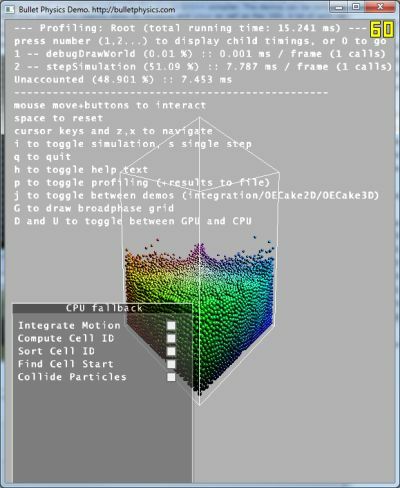 The main new feature of Bullet 2.77 is the OpenCL and DirectCompute hardware accelerated cloth simulation (part of BulletSoftBody). More information about this new release HERE. You can download Bullet 2.77 SDK and demos HERE. OpenCL and DX11 cloth simulation as part of BulletSoftBody. See Bullet/Demos/OpenCLClothDemo and Bullet/Demos/DX11ClothDemo. This is an initial implementation, and there is no support for collision detection or other advanced features yet. New btParallelConstraintSolver as part of BulletMultiThreaded. Although mainly targetting PlayStation 3 SPUs it also accelerates multi-core PCs. See Bullet/Demos/MultiThreadedDemo or get the spubullet-2.77 from PS3 Devnet. Many more bug fixes and minor features. Ok I have some first numbers. The VSYNC is enabled by default in the demos. You have to force it to off in NVCPL. Cool! I thought I had it disabled already! thanks! The clock demo seems to be stuck at 60fps though! Nice. ATI’s demos don’t work on ATI hardware. 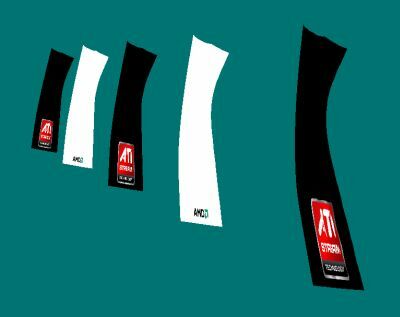 ATI/programmers , future is now! Can anyone check if Bullet’s cloth implementations (both CPU and GPU) are faster then PhysX’s? It’s just i do not have any of them, but a comparsion would be great! Of cource with similar scenes. Dude, do the particles demos work for you? In both of my ATI machines they failed. Even the CPU part failed. WTF? maybe we have to uninstall PhysX driver? You mean to uninstall the PhysX driver from the ATI machines? Do you think there’s a connection? So I take it you are having problems as well?